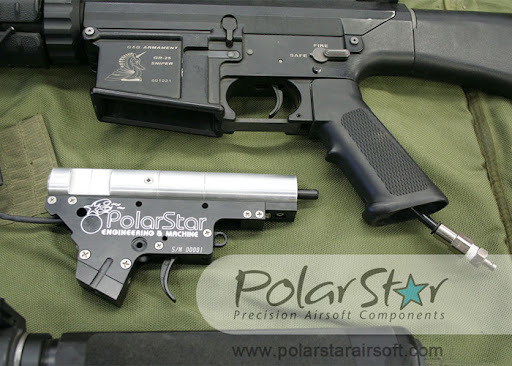 If you've had the privilege of owning a PolarStar Fusion Engine, you will undoubtedly be aware that the trigger response is lightening quick and distance required for the actual trigger to travel in order to fire the weapon is very small. However, since they use the standard AEG triggers, which are made with a rather long trigger pull, there is a lot of unneeded travel time before the trigger actually hits the button inside the engine which begins the firing process. The solution to this is insanely easy, makes a HUGE difference and many of you may already know about it. I know I just put up an unboxing video, but sometimes things just can't wait. Like the arrival of my Classic Army CA25 that I had custom-fit with one of the new PolarStar Fusion Engines, which, if you haven't heard, is an HPA-powered "drop-in" solution to many of the issues that plague the current AEG gearbox designs. 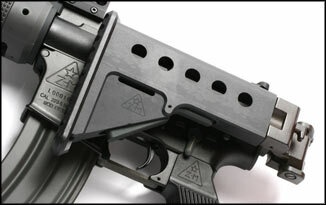 HPA stands for High-Pressure Air and generally refers to an external air tank which connects to the gun via a remote coil air line. It's basically a paintball tank rig. 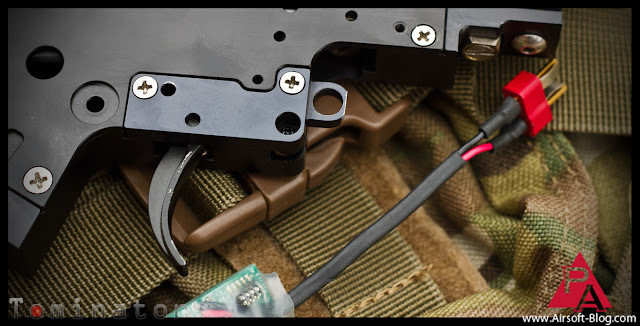 Anyway, I've mentioned the PolarStar stuff here on the Pyramyd Airsoft Blog in the past, so read up on that to get an overview of where I'm coming from here. Also, I just realized it's not Tuesday Newsday anymore. The stupid video took forever to upload and then I got sidetracked. Since I haven't gone to bed yet, despite it being 2:30am, I'm still calling it Tuesday. Check out my PolarStar PR-25 unboxing video after the jump. So my brother, Todd, & I invited ourselves to the G&G Armament Booth party happening at this year's Shot Show back in January to see what all the fuss was about. This year being my first Shot Show experience and not knowing my rear end from a hot rock, I didn't think about making appointments to meet with the various companies that I wanted to see, so when I got there, they were swamped and didn't really have anyone available to chat with me. With my limited time budget, I simply had to snoop around on my own to see what they had on display. Suffice to say, they had quite a few guns on display. Some new. Some not-so-new. Either way, I snapped a few shots of things that caught my eye. I will selfishly admit that there were some items that I did not take photos of because I was not personally interested in them, but I realize now that I wasn't really attending this show for ONLY me. It is for you readers out there as well, so I apologize for being lame and selfish. 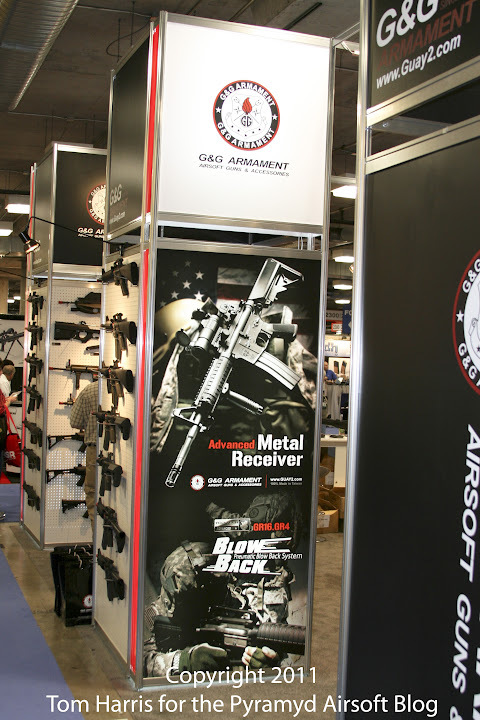 Despite there being a ton of photos from this year's show, expect even more next year so that I can provide as close to a complete report of the Airsoft activity there at Shot Show as I possibly can. Anyway, enough blabbering. 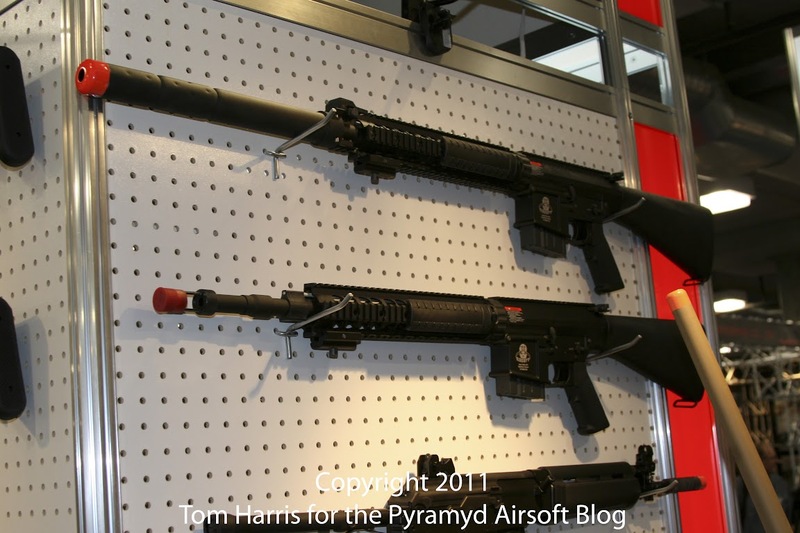 Let's get some of the nice Airsoft AEGs that G&G Armament had to offer. As if to say, "Hey! Look at me, I'm important!" 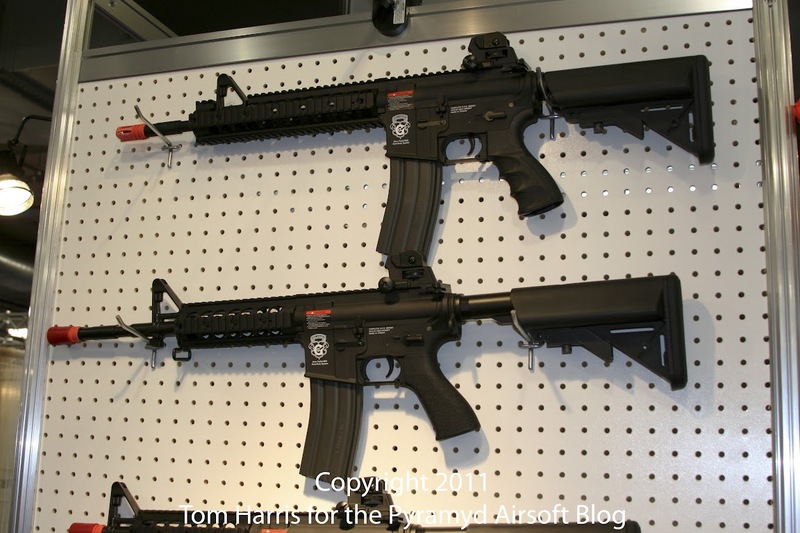 G&G Armament had their LR300 series Airsoft AEGs. In the photo, you see the GR300 Shorty and GR300 Long Version AEGs. Photo: G&G Armament LR300 SR from G&G's Official WebsiteG&G Armament is also making the LR300 SR (Short Rifle) which has what I would call ZM's signature folding stock on it. All the G&G Armament LR300 models are officially sub-licensed from a company called, "Evolution," who holds the world-wide licensing rights to the company responsible for producing the real steel LR300s, ZM Weapons. From what I understand, G&G's arrangement with Evolution is very similar to what Cybergun and Umarex are doing where they hold the license to the trademarks, and then they sub-license to other manufacturers like G&G, King Arms & VFC, for example, to use official trademarks on their guns. The LR300s were posted up near what I'm calling the front entrance to their booth. Truth be told, their booth was located in such a way that one could enter from three of the four sides to their large Shot Show real estate, but I'm going to declare the side that I entered from the front for the sake of the flow of content in this particular blog. In any event, with the folding stock feature alone, the G&G Armament LR300 AEGs are going to make great options for CQB or MOUT facility games where the space you're engaging your targets (and they are engaging you) is going to be limited to one degree or another. Obviously, the G&G LR300 Shorty is going to be the best option because it not only has the folding stock, but also the shorter barrel, to alleviate some of the difficulty one can run into when trying to manipulate their Airsoft gun in a close quarters environment. 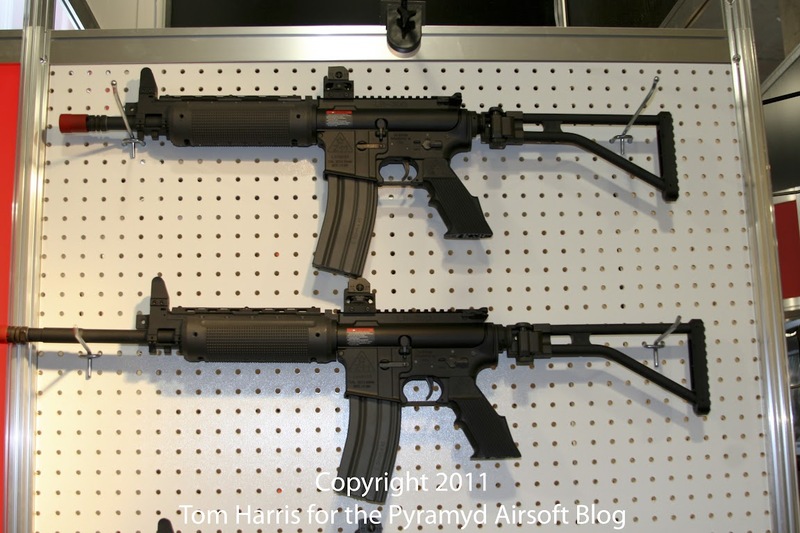 Here are some G&G Armament GR15 Raider Electric Blowback rifles. Not really "new" per se, but not really anything you can do about it now, is there? I've already posted the picture. Sorry. The G&G GR15 DST XL Raider. 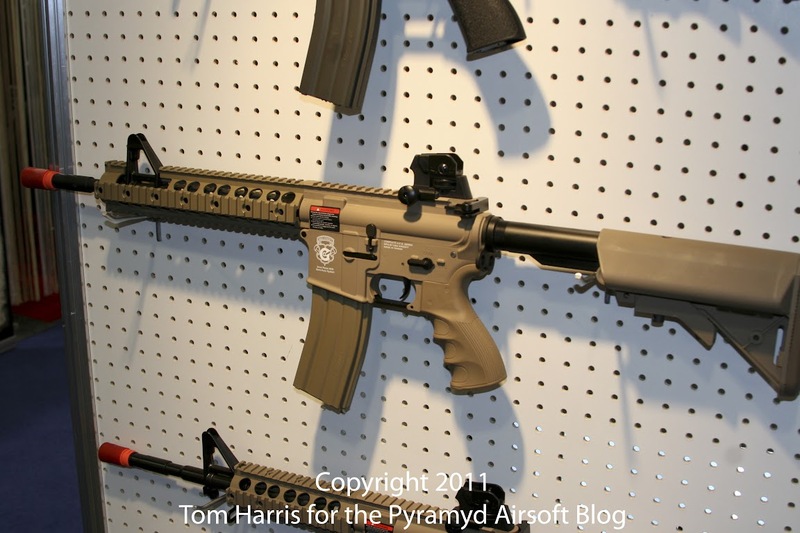 This is what I'm pretty sure is the same G&G Armament GR15 Raider I mentioned above, only in tan. Just a theory. 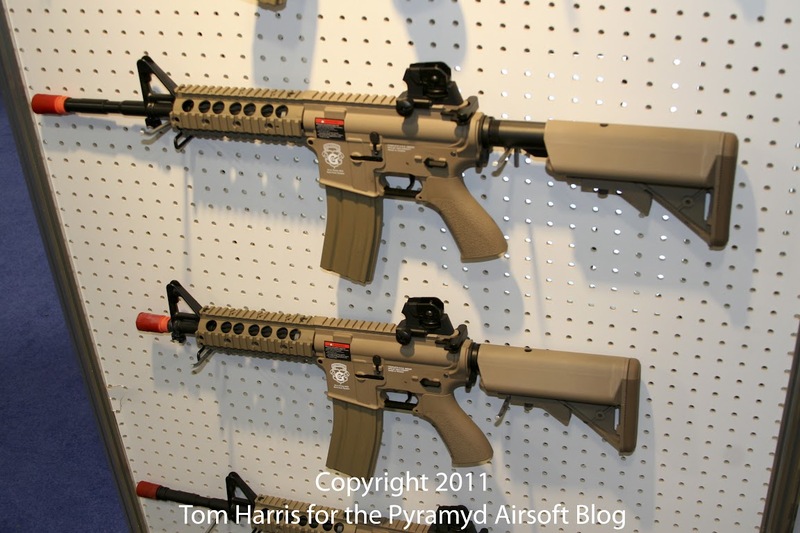 More tan G&G GR15 DST Raiders, more suitable options for Airsoft CQB purposes. Plus a glimpse of the WA2000 Sniper Rifle that G&G had on display as well. Airsoft. It's why I wake up in the morning (even on Mondays).